Personal: Married to PWBA competitor T'Nia (Falbo). Has one son (Lincoln) and one daughter (Brayleigh). 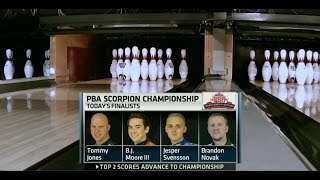 2019: Matched his best finish in a major with a fifth in PBA World Championship losing to Jakob Butturff 236-183 in opening stepladder match...Finished second in PBA Scorpion Championsship to tie career best finish of second in 2016 Scorpion Championship. Lost to Kris Prather 200-190 in title match. Career: In 2018 finished fifth in PBA Tournament of Champions for career best major finish losing to Matt O'Grady in opening stepladder match 219-174...In 2016 finished second in PBA Scorpion Championship for career high tour finish. Lost to Tommy Jones 211-168 in title match. Also finished fourth in Cheetah Championship...Previous best PBA Tour finish of sixth (three times) in 2015...Member of 2016 PBA League Elias Cup champion GoBowling.com Dallas Strikers...Owns one PBA Regional title. Was member of U.S. team that won USA vs. The World special event in WSOB VIII.